Tonight I sit gazing out of my third floor window. It is 10.30 pm but midsummer light still glows, painting striped bands across a pale blue wispy sky. Birds are singing. The river runs through the park below our house; it sounds as mellow as I feel, having had a precious, relaxed day: morning coffee and deep talk with a friend; lunchtime theatre with my husband, then lunch in the local Botanic Gardens, Glasgow, UK, watching the world go by, all of us enjoying a glorious summer’s day. Home, then a long rest with tea and a brilliant book. After that, supper with my brother and nephews, always zany fun. Even the tadpoles in my brother’s untidy back garden look mellow. I feel blessed as the solstice approaches. I wanted to share some of this mellowness with my faithful blog followers and readers. 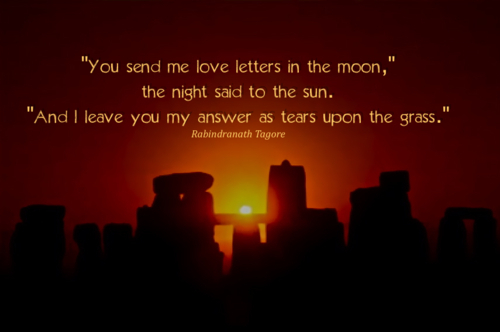 Happily, I soon found this wonderful image and quote from Rabindranath Tagore, a favourite poet of mine. I love the enigmatic, poignant, mysterious quality of this quote. Hope you do too! This entry was posted in 02 - New Posts: January 2014 onwards, Favourite Quotes (archive) and tagged Botanic Gardens Glasgow UK, Rabindranath Tagore, Stonehenge, Summer Solstice. Bookmark the permalink. Happy solstice! Mine turned into all blackberries and tomatoes — not the worst way to celebrate summer. Wish I could! There are so many tomatoes they’re about ready to drop the price to almost nothing. I’m going back out this afternoon to pick a variety that’s apparently excellent for sauces – fewer seeds and a just slightly sweeter taste. Yum! Hi Linda – just noticed that my reply to your first comment appears not to have materialised. I think I said that I wished you could send me some home-grown tomatoes – which I love – via email! Actually, Anne, it did materialise, even if it seems to have de-materialised on your end. The wonders of The Great Ether! Or that dratted Mercury Retrograde! Thanks to all of you who shared this post on Facebook – much appreciated! I had a friend visiting from Vancouver during summer solstice…we went for a walk along the river to enjoy this special day. I love the quote and the story behind the meaning!